I have returned to Calgary safely and I’m celebrating our big blue Alberta sky and the embrace of my two teens, the dog and the cat. I begin the story of my summer travels with things that I saw and experienced most recently and will make entries backwards to July 12th and my arrival in London, England. It is appropriate that I should begin with a dream come true…a very intimate and soulful visit to Giverny where Claude Monet lived and painted…a meander through the footpaths above the town to see the views he would have experienced, a tour of his home and the excitement of vivid colours and Japanese woodblock prints…French foods and wine…connections with local people and sleeping in a Medieval stone home…many experiences that I will add here as I go. The photos will also be titled differently as I continue to forge through the 3000 photos I took on this journey. This is just a beginning. I am filled with gratitude and fond memories of a journey to Giverny in Normandy with my artist friend from art college 1998-99. When I was in University, I’m sure my friend and I had a special place in our hearts for the Impressionists and especially Claude Monet. Her mother and father had sprawling country gardens on their farm property outside of Barons, Alberta and my own parents had been serious gardeners for as long as I could remember. 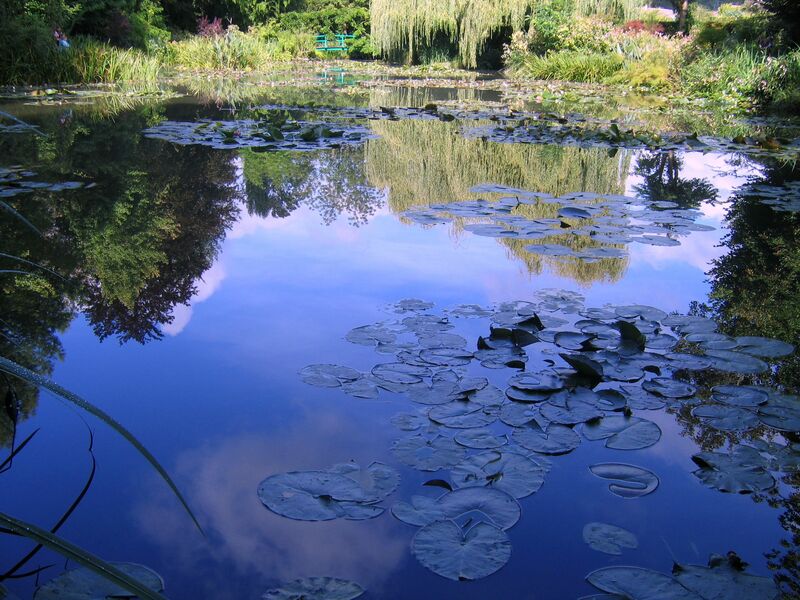 In 2001 I attached a small calendar image of Monet’s water lily gardens to my fridge door, thinking that perhaps if I was very positive and projected the possibility of a journey to Giverny onto my life map, perhaps it would happen. Just one week ago I stood on a bridge in that very garden all alone. Because of a very special circumstance…on a brilliant blue day…I had gained access to these peaceful gardens and painted two small sketches. The memory as I write this morning gives me chills. It was an unbelievable situation, place and time! This entry was posted in Travel by Painter Lady. Bookmark the permalink.